I recently enjoyed a bomber of Harpoon’s 100 barrel series Polskie Manste. The site lists it as a Polish Amber Ale, but I’ve also seen it as a Polish Old Ale. So who knows. Either way, I originally set out to clone the beer. But I ran into so many bumps along the way that at this point I’m aiming for “beer”. This is the first All Grain recipe I created from scratch and second time doing Brew In A Bag overall. I couldn’t get half of the listed ingredients (see above about the bumps and stuff). 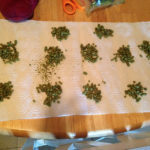 And had to substitute both grains and hop additions. The taste profile I am aiming for is a hoppy (but not necessarily bitter) ale, and balanced with a malty character. 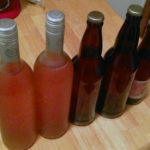 This, I am sure will end up nothing like what I planned, but the beer should turn out just fine. I did brew in a bag. I mashed all grains for around 65 minutes. When I was draining the grain bag into wort, the strainer I had the grain bag in slipped and both the bag and strainer fell into the wort (it was pre-boil, so sanitation wise it was okay but it sent sticky wort all over my kitchen). I pressed the bag to get all that extracted malt wort out of the grain. I boiled the wort using the above hop schedule. Fermentation had begun. I didn’t affix a blowoff tube, but there was no blowoff, so that’s good. Wondering if this is just how US-05 Works. It ferments very rapidly for the first day or 2 and then slows to little or nothing. A pretty long primary as far as beer goes. Now it’s all bottled up. Unfortunately I’m still new at making my own recipes form scratch. Because of this I undershot my intended ABV by 33%. I was shooting for 6% and got 4% instead. I’ve already adjusted the recipe’s grain bill above to accommodate this. 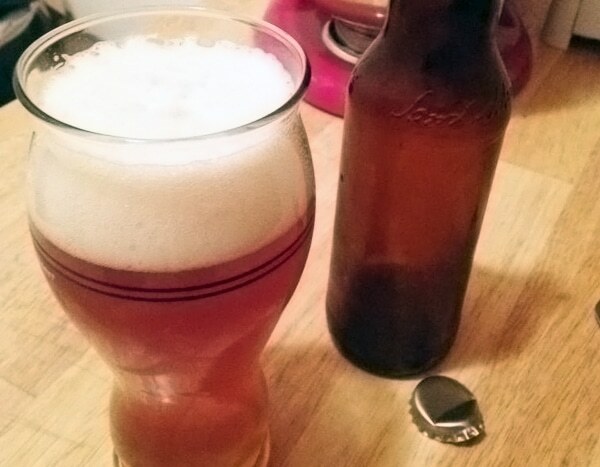 As far as taste goes (pre-carbonation, it’s conditioning now), It’s actually pretty close to what I wanted. I attribute this almost entirely to the Northern brewer Hops, they really give you the dry, resinous, stick to your throat, character that you find in a lot of European Bitter beers.